This photograph was taken in Austria of the side of a gas pump. 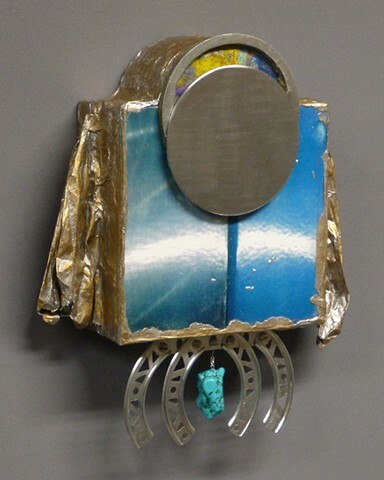 After transferring it to the canvas, I added silver-painted paper mache wings, a steel ring framing one of my old paint rags covered by a belt-sanded steel disk, an imitation turquoise pendant and pieces of a vintage Erector Set my brother John gave me. It bought to mind the winged creatures in Hindu and Buddhist mythology. female spirits of the clouds and waters.